Spring and summer are peak visitation time. Visit in the winter or fall months for less crowds. If you are planning on visiting the Community Gallery (L3) or the Culture Gallery (L4), plan a visit in the morning hours when the upper floors tend to be quieter. By contrast, the History Galleries (C3 to C1) are least crowded toward the later afternoons. The History Galleries are comprised of ramps, which are more than a mile in length. For visitors with limited mobility, we offer a limited number of manual wheelchairs to make navigating the ramps less challenging. The Museum has 85,000 square feet of exhibition space. Be prepared to stand or walk for long periods of time. See our Visitors with Limited Mobility section for more information. Visit the Sweet Home Café before noon or after 2:00 p.m. to minimize wait times and crowding. Both entrances to the Museum on Madison Drive and Constitution Avenue NW are accessible. There is a bus drop off location on Madison Drive. The easiest way to visit the Museum is to travel by public transportation. Please visit www.wmata.com for more information. The Smithsonian does not provide parking. There are National Park Service designated accessible parking spaces along Madison Drive adjacent to the Museum. Visitors with disability hang tags or license plates can park at metered spaces controlled by the DC government. Visit the DC government website for more information about their parking procedures and for an interactive map of Red Top Meter parking locations. The nearest public parking garage is located at the Ronald Reagan Building and International Trade Center. You may access the parking garage via ramps at 14th Street NW (north and south). Please visit the International Trade Center website for more information. All restrooms have one accessible stall and there are designated Family/Companion Care Restrooms on Level 2, Level 3, and Level 4 of the Museum. The Museum is accessible for visitors with limited mobility via escalators, elevators and ramps. Manual wheelchairs, standard and bariatric sized, are located behind the Security Desk near the Madison Drive entrance and are available to borrow on a first-come, first served basis. For visitors with mobility limitations, the suggested route through the History Galleries is to start on the C1 level and end at the C3 level. Visitors may enter through the Galleries’ exit located on the Concourse level, view the exhibits and then use the elevator at the C3 level to return to the Concourse. The route presents a reverse chronological experience but some visitors may find it to be less fatiguing. The Oprah Winfrey Theater, used for public programming, has accessible seating and transfer seating. For more information about wheelchair and scooter rental in the Washington, DC area, please visit the Smithsonian’s Accessibility Program (pdf) website. For visitors who are blind or experience low vision, there are Braille/raised image maps and large print maps located at the Walmart Welcome Desk. Visitors may borrow these maps to assist with wayfinding and orientation while visiting. Currently, the Museum does not offer tactile tours. 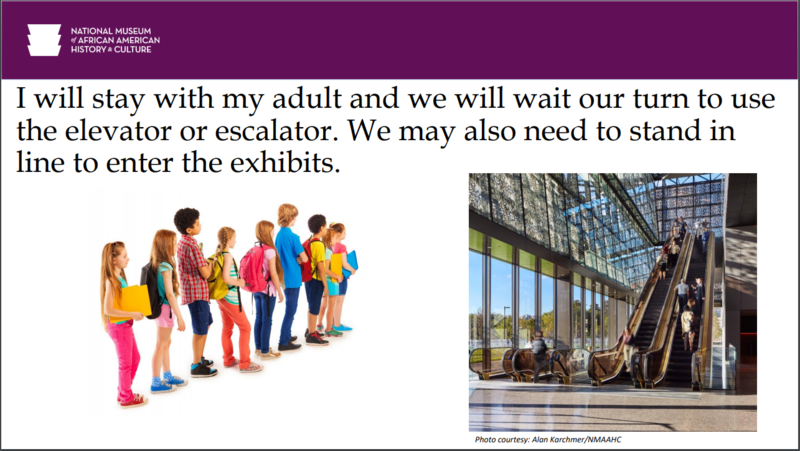 However, Docents and Visitor Services staff are trained to offer sighted guide and verbal description for visitors. Visitors may choose a 45-minute highlight tour of the Museum or a tour of the gallery of their choice. If you already have a Timed Entry Pass and would like to arrange a sighted guide tour in advance, please contact nmaahcvisitorservices@si.edu. Service animals are permitted on the Museum grounds and in the building. All videos in the Museum are open captioned. American Sign Language (ASL) interpretation is available for public programs by contacting the Museum with 2 weeks advanced notice. To schedule ASL interpretation please contact nmaahcvisitorservices@si.edu. Smithsonian informational brochures are available at the Welcome Desk in the following languages: Arabic, Chinese, French, German, Italian, Japanese, Korean, Portuguese, Russian, and Spanish. Museum floor plan maps are available in Chinese, French, and Spanish at the Welcome Desk. Sensory Maps showcase each exhibition level and highlight areas where sounds are loud, lights are bright, and where visitors can touch. A Seek and Find can be used as a "scavenger hunt" throughout the museum. Social Narratives for visitors who need detailed layout of their surroundings and expectations, from security procedures to escalators/elevators to thematic overviews of each exhibition. All materials are available upon request at the Welcome Desk. Morning at the Museum is a project of the Smithsonian Institution's Accessibility Program and the Smithsonian Museums. The Smithsonian has developed pre-visit materials for families guided by a Community Advisory Committee comprised of museum educators, exhibit designers, professionals who work with children with cognitive or sensory processing disabilities, parents, and self-advocates. On select dates, families are invited to visit a Smithsonian museum before the public opening for a special experience. To register for Morning at the Museum or to request information, email access@si.edu. NMAAHC's Visitor Services team has developed pre-visit stories for families who have children with cognitive or emotional disabilities. The pre-visit stories help prepare children for the situations they might encounter when visiting the museum and address what to expect, museum rules, and safety information.